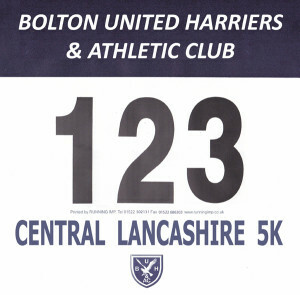 All the entries currently received and processed for the upcoming Central Lancashire 5K are listed here. Most importantly, you can find out your RACE NUMBER or ‘BIB‘ which you will need to pick up your race pack at Registration. Entered? Find out your running number (BIB) below. Information is currently ordered alphabetically by SURNAME. If you have a common surname, please take care when noting your race number (e.g. perhaps check the AGE) to avoid your assigned number being given to the wrong competitor. 2015’s race saw three runners with the same forename and surname! Please also double-check that your details are correct, especially your displayed age (and gender!) – Date-of-Birth input errors can occur! It is important because these small details may affect the result in a particular race category. If you do notice an error in your assigned age, gender, name spelling or UKA affiliated club (or that of a teammate), please notify us ASAP. Please note 133 entries have been processed. When the race limit is reached, no further entries are possible under any circumstances. Entry on the Day is for CLGP club members ONLY, subject to the race limit permitting. Early arrival is advised to avoid disappointment. The FINAL pre-entry update list will appear on Thursday before race day.